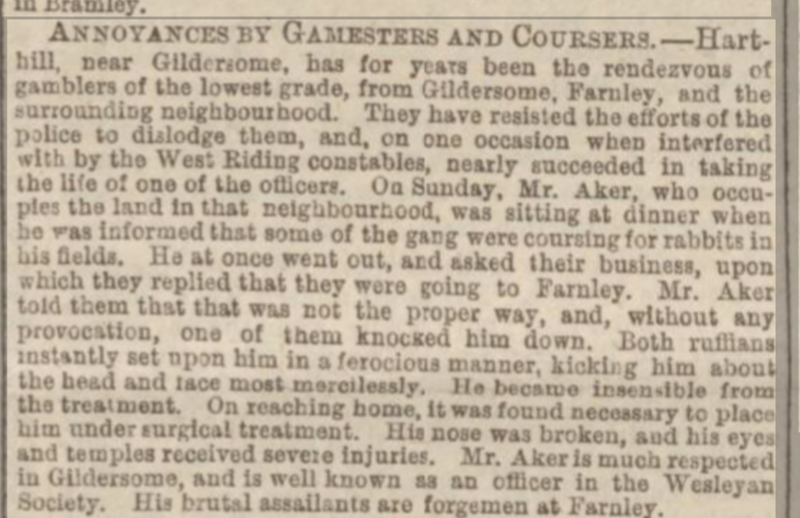 Concerning “The Recent Daring Burglary at Gildersome Parsonage"
In 1878 an article in a local newspaper reported the retirement of Superintendent John Pollard from the Skyrack Division of the West Yorkshire Constabulary. The article listed Mr Pollard’s more notable achievements, including a burglary at Gildersome in which six men had broken into the parsonage. 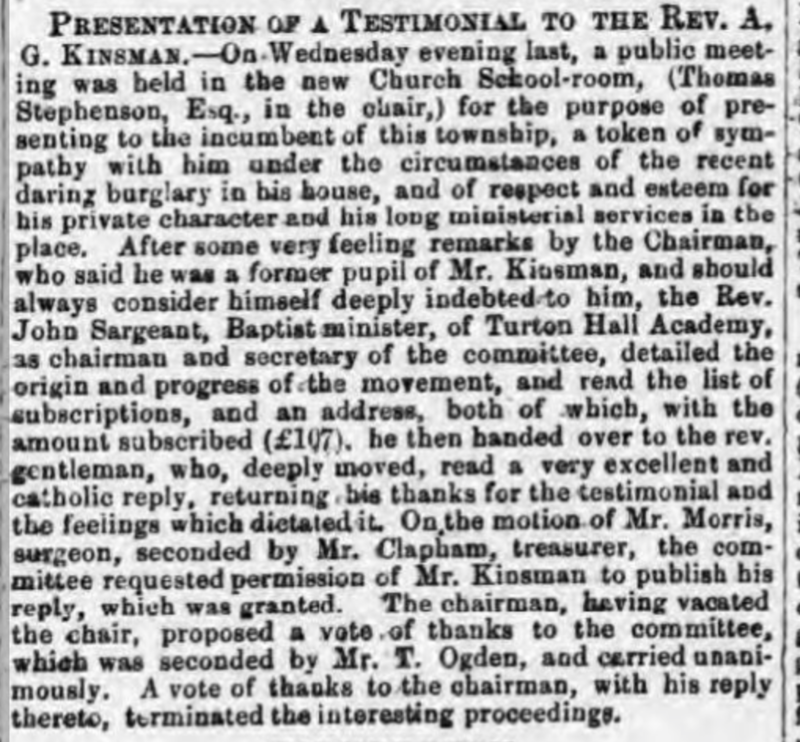 The report goes on to relate that, in gratitude for services rendered, the ‘Reverend AG Kinsman presented Mr Pollard with a silver snuff box, which the recipient cherishes to this day.’ ¹ The following discussion examines the circumstances that led to the Reverend Kinsman’s generous expression of gratitude following a criminal encounter that would receive newspaper coverage on a national scale² and outlines the events that resulted in several local men facing the death penalty. Those events are scrutinised alongside a similar event that had taken place almost exactly a year earlier and within the context of widespread anxieties concerning contemporary perceptions of crime and criminality. The Reverend Andrew Guyse Kinsman and his family lived at an isolated parsonage at a location known locally as Nova Scotia. 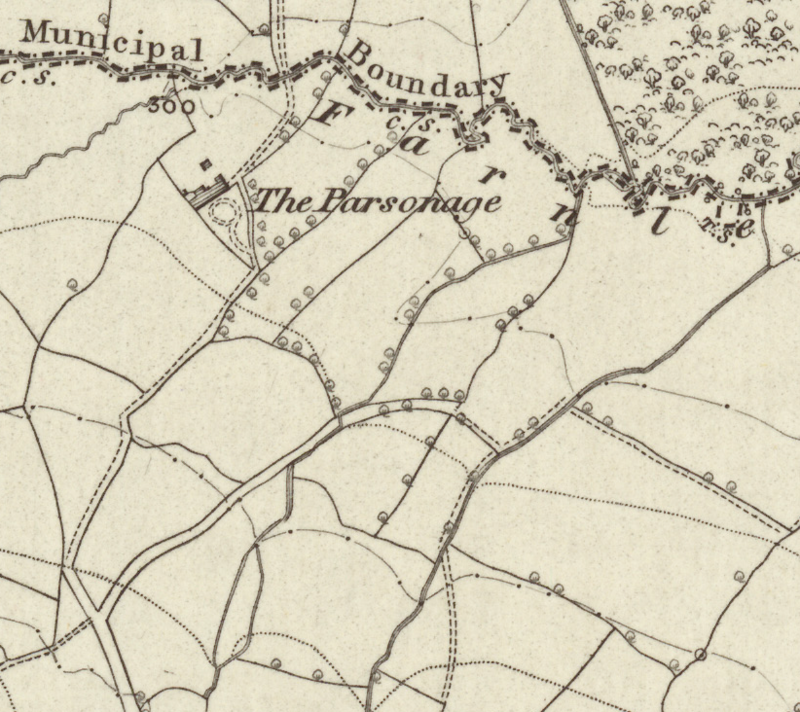 The etymology of that name reveals that it was often ascribed to remote and difficult to access locations.³ The parsonage was purchased in 1793 by the Diocese of Wakefield for the Benefice of Gildersome and consisted of five acres on two plots called, at that time, the Low Carrs which contained a two storey dwelling house and all the appurtenances of a working farm.⁴ Gildersome's curate had been living there since 1819. Situated as it was, on the boundary with Farnley, it's location was obviously secluded and would have presented an attractive target for desperate men with felonious intentions. 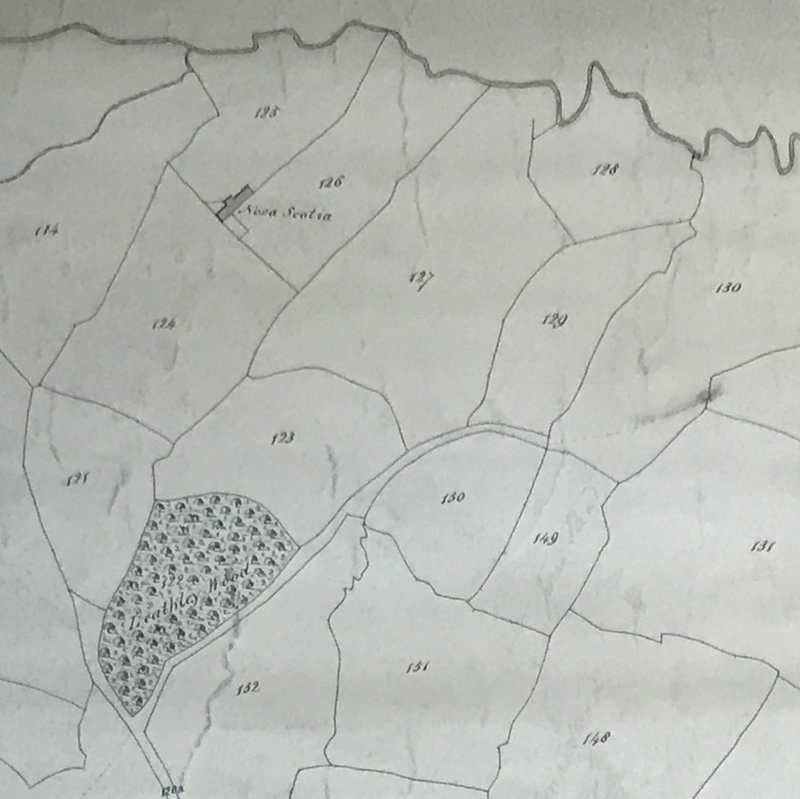 The three maps on the right show how little the northern region of Gildersome has changed in the past 218 years. 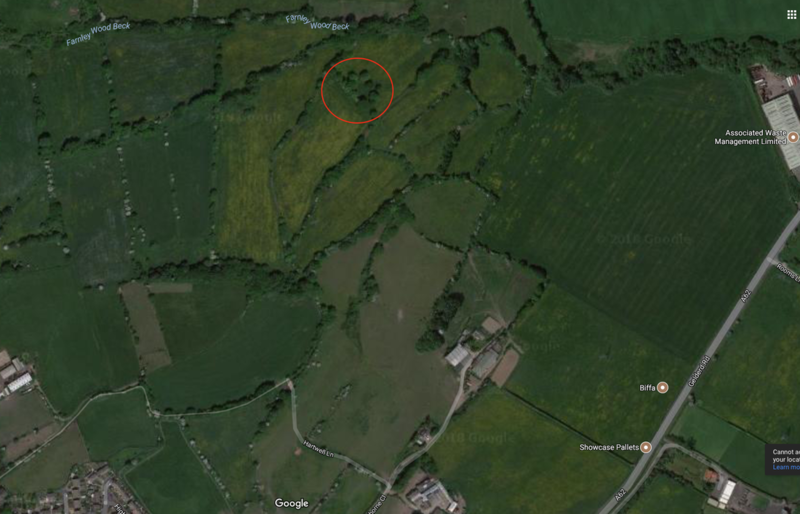 The red circle in the bottom aerial photo marks the location of The Parsonage/ Nova Scotia. The opening of the new turnpike road (Gelderd Road) in 1825 had provided Gildersome with easier access to the neighbouring city of Leeds. This would have endowed a considerable improvement to Gildersome’s commercial interests, though this was an improvement that came at a cost. Gelderd Road also provided those of an unsavoury nature with a convenient route to the remote locations along Gildersome’s northern boundary. The scattered estates and outlying farms that had previously enjoyed a relatively peaceful existence were now beset by “blackguardly fellows” intent on taking nefarious advantage of the area’s seclusion. To read a detailed account of the burglary by a contemporary newspaper click here. 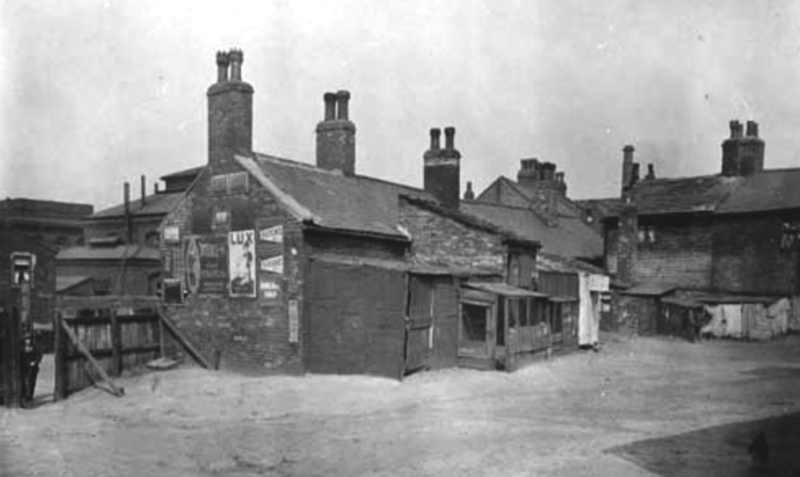 Hainwsorth grew up in the hovels and shacks of Stocks Hill, Holbeck, mentioned in the article above. Kinsman then turned his attention to the second defendant. The witness also related how he had seen footprints the morning after the burglary, which appeared to have been left by iron-plated clogs. One of Williamson’s clogs had been examined, but no comparison could be proved. Needless to say, Hainsworth and Williamson were extended no such sympathies. They were sent for trial at the York Assizes where a verdict of death would be recorded against them. It may be useful, at this point, to take some account of the context in which the Gildersome burglary had taken place. The Crimean War had ended in February 1856, generating widespread anxieties of recently discharged and unemployed soldiers roaming the countryside in search of sustenance.²³ Added to which, the 1853 Penal Servitude Act had created another harbinger of impending doom: the so-called “ticket of leave man” newly returned from his sentence of penal servitude in the colonies.²⁴ It has been suggested that these elements, together with a continuing increase in popular newspaper sales, had given rise to a generalised panic at the idea of bands of ex soldiers and convicts visiting terror on an unprotected countryside - a situation that had been instrumental in the passing of the County and Borough Police Act of 1856.²⁵ The West Riding Constabulary, under whose authority Superintendent Pollard investigated the Gildersome robbery, had been inaugurated in response to the act. It is evident from the number of men involved at Manor Oaks and the fact of their being masked and armed that there are clear similarities with the events described at Gildersome parsonage. In both cases, for example, a gun had been found on the premises and turned against its owner. In the Gildersome robbery, however, the intruders had been described as being armed with pistols when they entered the premises. A point that was never contested by the defence, though it should be borne in mind that to have done so would have amounted to an admission of the accused’s involvement. It is not inconceivable that a certain amount of exaggeration might have taken place, either on the part of the prosecution in order to secure as stiff a sentence as possible, or indeed of inaccurate, sensation-seeking journalism. Following the robbery at Manor Oaks, inspector Linley of Sheffield police had examined the garden in front of the house and, as appears to have been the case at Gildersome, footprints were found that might provide evidence against the perpetrators. At Manor Oaks, however, it would be established that boots worn by one of the accused corresponded to the marks found in the flowerbed and this was used as evidence against him. Another critical difference to the Gildersome case was that witnesses were brought forward to confirm that seven men had been identified loitering in the area. Dickinson, Gledall,³¹ Simpson, Glover, Ewings, Gouldthorpe, and Marsden, most of who were Barnsley residents had been seen and recognised by witnesses.³² As was the case at Gildersome, some of those were discharged and only three of the accused (Gledall, Dickinson and Marsden) would be found guilty. However, perhaps the most noteworthy connection between the two cases is provided by the fourth name on the original list of loiterers. After his acquittal, Reuben Glover, alias Smith, moved from Barnsley to an address in Leeds, where, as we have seen above, he was apprehended (and later discharged) for his alleged involvement in the Gildersome parsonage robbery. It may be justifiably argued that the credibility of the Sheffield prosecution witnesses is open to doubt given that a substantial reward for information had been posted.³³ Nevertheless, in comparing the two cases it is difficult to reach a conclusion other than that the Manor Oaks offenders had been convicted on a far stronger body of evidence than that presented in the Gildersome case, in which an absence of such witnesses meant that the men found guilty of the Gildersome burglary were convicted entirely on evidence provided by their alleged victims. The Home Secretary’s intransigence was perhaps reflective of an era in which offences of this nature had been viewed with increasing trepidation. From the comfortable distance of a present day perspective the sentences passed on Williamson, Hainsworth and Duthoit can appear to have been arrived at in a spirit more inclined toward expediency than impartiality. However, it should be borne in mind that, within the context of the 1850s, those convicted of the Gildersome parsonage robbery were dealt with in accordance with the legal system of the day. The circumstances of the case clearly indicate that a serious misdemeanour had taken place, though we need to be mindful that this was established entirely on the grounds of evidence provided by the victims.³⁷ The Gildersome parsonage burglary was without doubt a terrifying experience, though it is not beyond the scope of possibility that the Kinsman family were not the only victims. Some 3 years after the robbery, the Kinsman family were residing at Yarra House in Gildersome. At the age of 73, Andrew Guyse Kinsman was continuing his duties as the curate of Gildersome.⁴⁵ He died in 1867 at the age of 79 leaving an estate to the value of £600.⁴⁶ In the 1861, census Kinsman's daughter, Louisa, is found living at 'Knovy' (the Parsonage) with her husband, Robert Webster, and their family. In 1878 Superintendent John Pollard of the West Riding Constabulary retired from his post. Mr Pollard’s career was declared to have been ‘an excellent example of what may be done by sterling integrity and assiduous attention to duty.’ ⁵⁴ He retired on a pension of £125 per annum. 1] Yorkshire Post and Intelligencer, Tuesday, April 9, 1878. 2] The burglary received coverage across the country in newspapers ranging from the Hampshire Advertiser to the Dundee, Perth, Forfar, and Fife People’s Journal. 3] Field, J. (1972) English Field Names: a Dictionary. David and Charles, Newton Abbot, P.153. 4] West Yorkshire Archive Service WDP26/3/21. Extract from deed of bargain and sale 13 Mar 1793. 5] Intelligencer Supplement, Leeds, March 6, 1858. 6] Intelligencer Supplement, Leeds, March 6, 1858. 7] In 1858 banknotes would be very difficult to convert into cash, particularly so for those at the lower end of society who would probably have to “fence” them at a considerable discount. 8] Morning Advertiser, Friday, March 5, 1858. 9] Intelligencer Supplement, Leeds, March 6, 1858. 10] Leeds Intelligencer, March 6, 1858. 11] Leeds Intelligencer, March 6, 1858. 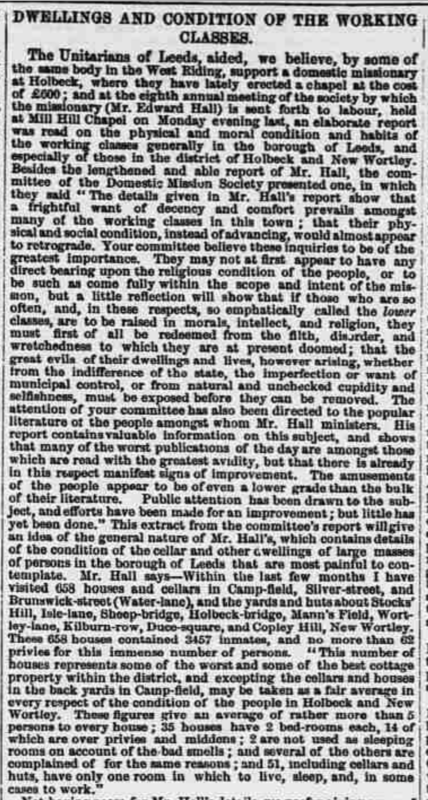 12] Intelligencer Supplement, Leeds, March 6, 1858. 13] Intelligencer Supplement, Leeds, March 6, 1858. 14] Intelligencer Supplement, Leeds, March 6, 1858. 15] The life preserver consisted of a sturdy length of cane about 12 inches long. At one end was a knob consisting of 5 or 6 ounces of lead, at the other, a loop of leather strapping to secure it to the user’s wrist. Somewhat ironically, the life preserver became a popular self-defense device in the wake of the Garotte robberies that were prevalent in 1850s England. 16] Intelligencer Supplement, Leeds, March 6, 1858. 17] Intelligencer Supplement, Leeds, March 6, 1858. 19] Sheffield Daily Telegraph, Wednesday, May 5, 1858. 20] Leeds Times, May 15, 1858. 21] The Royal Alhambra Museum and Promenade Concert Hall “the palace of cheap and rational amusement for the people” was situated in King Charles’s Croft, Leeds. 22] Leeds Times, May 24, 1858. 23] Taylor, D. (1998) Crime, Policing and Punishment in England, 1750-1914. Macmillan Press, Basingstoke, P.78. 25] Taylor, D. (1998) Crime, Policing and Punishment in England, 1750-1914. Macmillan Press, Basingstoke. P.78. 26] Supplement to the Sheffield and Rotherham Independent, March 21, 1857. 27] Supplement to the Sheffield and Rotherham Independent, March 21, 1857. 28] The Hook sisters claimed to have been struck by life preservers during the robbery, though no injuries appear to have been reported at the trial. 29] Supplement to the Sheffield and Rotherham Independent, March 21, 1857. 30] Sheffield Daily Telegraph, Monday, March 15, 1858. 31] The Sheffield Daily Telegraph uses the spelling ”Gledall” though prison documents use Gleadall. 32] Supplement to the Sheffield Daily Telegraph, Monday, March 15, 1858. 33] Supplement to the Sheffield Daily Telegraph, Monday, March 15, 1858. 34] Supplement to the Sheffield Daily Telegraph, Monday, March 15, 1858. 35] Intelligencer Supplement, Leeds, March 6, 1858. 36] Prison Register Correspondence and Warrants. 37] It should also be borne in mind that the entire narrative of the burglary is based upon evidence provided by the victims. It was John Guyse Kinsman, for example, who outlined the method of entry. 41] Victoria Police Gazette, June 13, 1871. 43] Victoria Police Gazette, June 13, 1871. 44] Western Australia Death Index. 46] Wills or Administrations after 1858 – National Archives. 53] 1910 United States Census. 54] Yorkshire Post and Intelligencer, Tuesday, April 9, 1878.